I'm now taking the road less traveled! I recently packed up my desk things (way too many, even for 7 years of collecting — 3 silly putties for keeping me occupied in meetings) and departed my 9-5 job complete with benefits & a discount. I left to seek out a change of pace, to refresh creatively and to follow dreams that fell by the wayside for too long. Freelance was something that always seemed a little daunting — learning the business side of things in particular — and I'm sure in the past it would have been much more intimidating at this jumping off point, but I do believe in timing, and life brought me to this road at the right time. This is a new challenge but one I am ready, and psyched for! Last week was jam packed with photo shoots for Whole Foods! We managed to fit in over 90 shots in four days. I'm not quite sure how it happened, but we got it done with a lot of help from some superior chefs, our fabulous photographer Mark Doolittle, and lots of tasty treats. As these things go, I ended up with far too many baked goods! Happily my roommates were only too pleased to help eat them. Here I am doing a bit of food styling—one of my favorite parts of these projects. Hi there, blog. I'm Annie. This is awkward. Just like meeting somebody for the first time, I suppose. I'm not sure exactly what we ought to talk about yet, but I can tell that I like you so far. There's a lot of potential for our new found friendship. I'm sure we have a lot in common. To kick things off, I'll share my latest side project. I found an old antique car horn at the thrift shop down the block. Only $7. With some serious hand-cranked hole drilling, wood glue, paint and natural acoustics, I now have a beautiful sounding iphone dock. The old, worn metal adds a nostalgic tin can sound—although still loud and radiant! Upon finding another horn in another thrift store, the owner inquired at my interest, and when he saw this photo he wanted to buy mine on the spot! I declined. This horn dock is near and dear to my heart, especially because my sweet Pa helped me construct it. 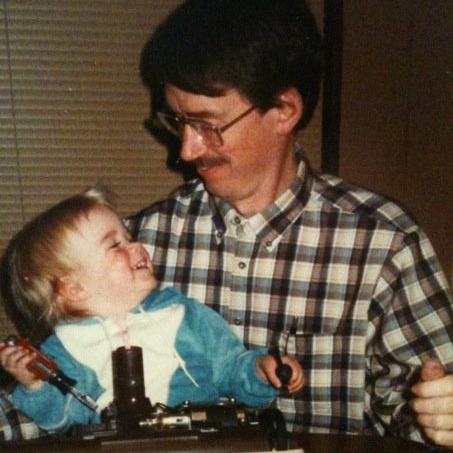 My dear dad, who urged on creativity and a passion for constructing things with my hands since I was just a teeny tiny.